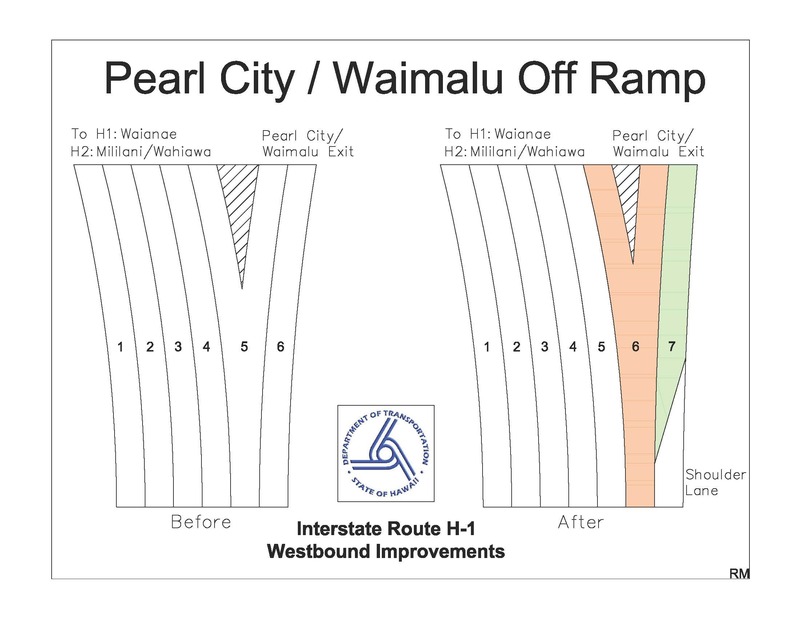 HONOLULU – The Hawaii Department of Transportation (HDOT) is pleased to announce the entire new lane on the H-1 Freeway Pearl City Viaduct from Waimalu to Waikele is now open for use. The new lane begins at the Waimalu/Pearl City offramp (Exit 10) to beyond the H1/H2 split. The two and a half miles of new lane will accommodate more than 2,000 cars per hour easing congestion through the State’s busiest corridor. 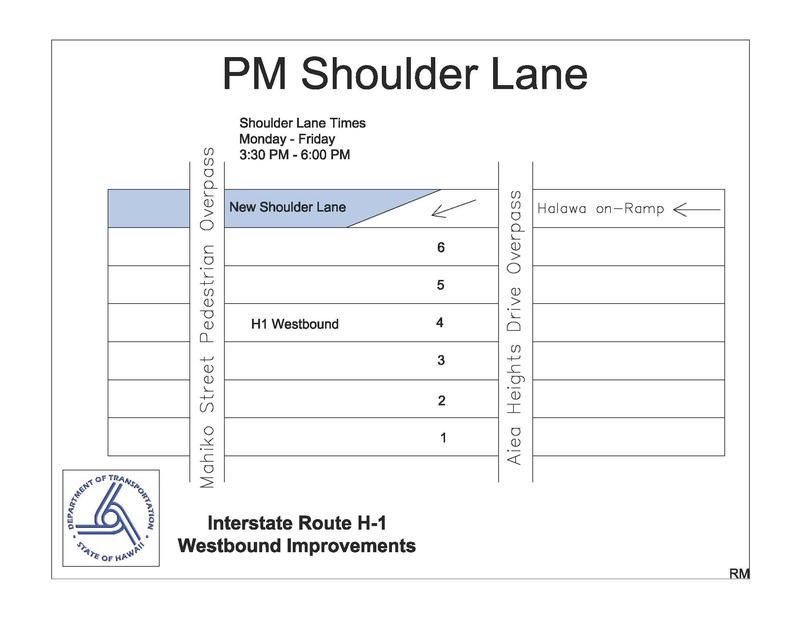 In addition, the new shoulder lane on the H-1 Freeway westbound will be available for use beginning Monday, Oct. 26. The shoulder lane will be open for travel during the evening commute from 3:30 – 6:00 pm, Monday through Friday, excluding holidays. The new shoulder lane begins at the Aiea Heights Drive Overpass to the Waimalu/Pearl City offramp (Exit 10). The new shoulder lane is two miles in length and brings added capacity during the busy evening hours. New signs and pavement markings will be added indicating the shoulder area and times. Drivers may enter the shoulder lane near the Aiea Heights Drive Overpass. Single occupancy vehicles are allowed. Trucks and busses are prohibited. Those using the shoulder lane and continuing west on the H-1 Freeway toward Kapolei will need to merge one lane to the left before the shoulder ends as they approach the Waimalu/Pearl City offramp. The merge must be completed prior to the solid white line. HDOT advises drivers to give themselves enough time to safely advance to their preferred lane. Please be alert and avoid dangerous maneuvers. Remaining construction activities includes resurfacing the far right westbound travel lane of the Pearl City Viaduct to create a smooth roadway for motorists. The new lane consists of what used to be the former shoulder. Repaving work will add a fast setting concrete overlay. The latex modified concrete mix is more durable and designed to protect and prevent damage to the structure. The paving work will begin in November. The work will be scheduled during the overnight hours and/or weekends in an effort to minimize traffic impacts. The paving work could not be completed earlier because the concrete barriers that separated the freeway traffic from workers had to remain in place. New sections of the lane were also opened as they were finished so drivers could enjoy the congestion relief benefits right away. Now that the entire lane is constructed it will be repaved all at one time. Following the paving work, crews will shift the overhead destination signs to align with the new lane configuration by the end of December. 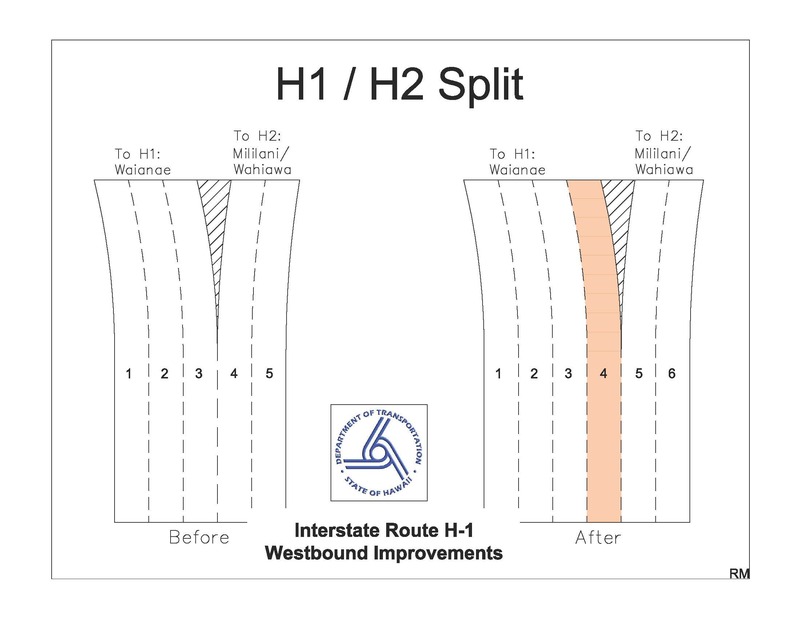 The Waipahu offramp (Exit 8B) in the westbound direction will be restriped to allow two lanes of travel before the Kamehameha Highway and Farrington Highway merge. HDOT advises the public to check its website at hidot.hawaii.gov for weekly lane closure updates and follow HDOT on social media. Motorists are encouraged to use the GoAkamai.org website and mobile apps for up to the minute traffic conditions and see live pictures from over 200 traffic cameras on Oahu to help plan your outing. For more information, call the project hotline at 808-945-1144 and visit the Pearl City Viaduct Deck Widening and Repair project website.